Slovenia is a popular destination for travellers from all over the world, and for several reasons. First of all, it’s a small country, so you don’t have to travel far from your holiday home to reach the many natural treasures the country has on offer. Secondly, it is blessed with some astonishing and pristine nature. The country is dominated by the mighty Alps, with their mountains, lakes and icy rivers. The mountains provide the perfect backdrop for hiking trips, as well as paragliding experiences, rafting adventures and the like. Also, one shouldn’t forget that other natural wonder of Slovenia: the Kras (or Karst) region, a limestone plateau in the West of the country. Karst topography is a landscape formed from the dissolution of soluble rocks, characterized by sinkholes, dolines, and caves. In short, as a holiday destination, Slovenia is synonymous with natural beauty and outdoor activities. But that isn’t all. Culture seekers won’t be disappointed either. 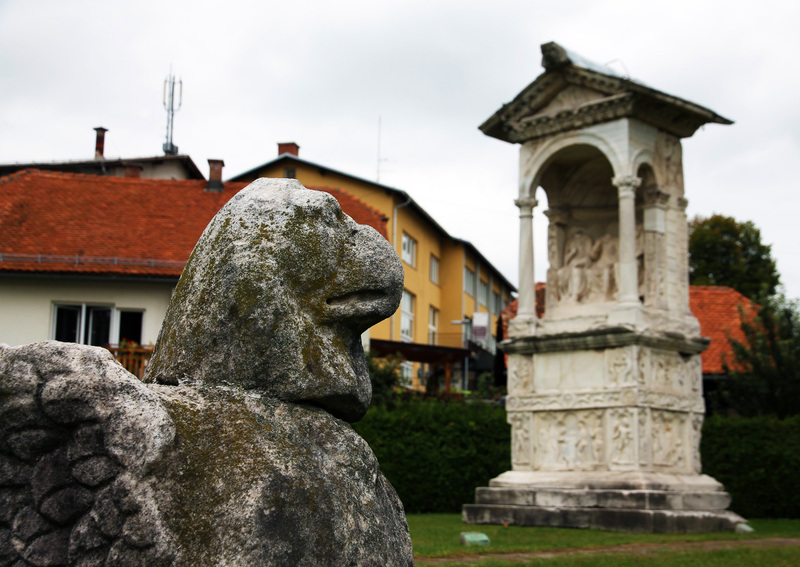 Whether you go for the 17th-20th-century centre of the capital, the 15th-century frescoes in the church of Hrastovlje or the prehistoric remains of pile dwellings in the Ljubljana Marsh, Slovenia always has something interesting and unexpected in store. We went out to visit the Roman necropolis in Šempeter, and it turned out to be the perfect spot to spend a few rainy hours. Now a small village to the northeast of Ljubljana, Šempeter, as part of Celeia (= nearby Celje), was once a thriving Roman town, situated along an important Roman road between Aquileia (in Italy) and Poetovio (Ptuj). Many rich Roman patricians lived here and they were also buried here. 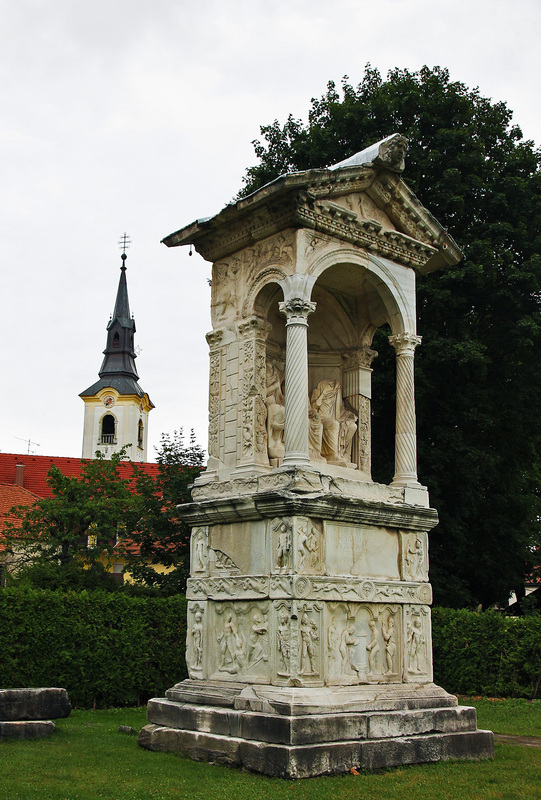 Their magnificent tombs, made of Pohorje marble, were washed away and buried during a flood of the Savinja river in 268 AD. A tragedy? 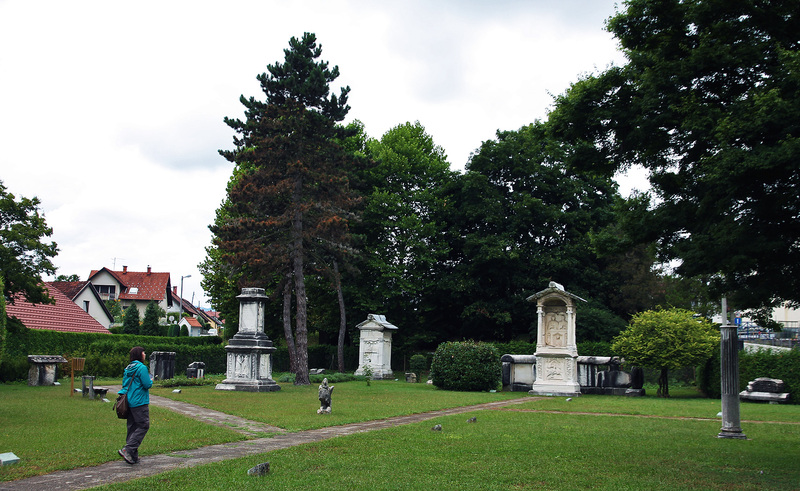 Not really, because these graves remained untouched until they were rediscovered in 1952. 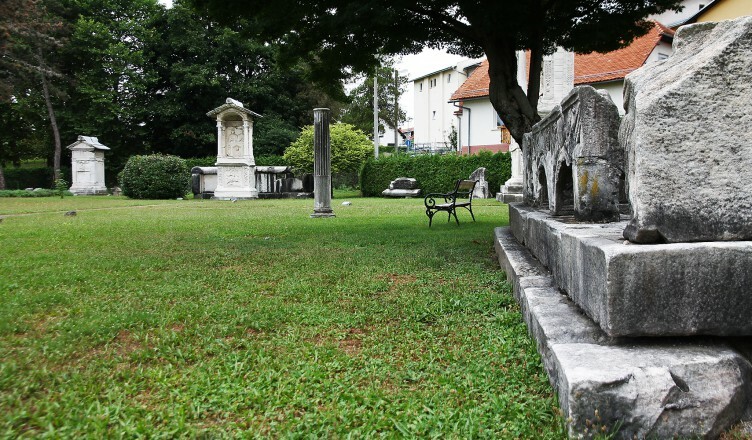 An astonishing number of 100 family tombs and over 600 fragments were found at this locality and some of them have been re-erected and are displayed in this open-air museum. Exploring the site of the Rimska necropolis on a grey, rainy day. Upon arrival, we soon realised we were completely alone here, except for the friendly guide who spontaneously proposed to give us a tour of the site. 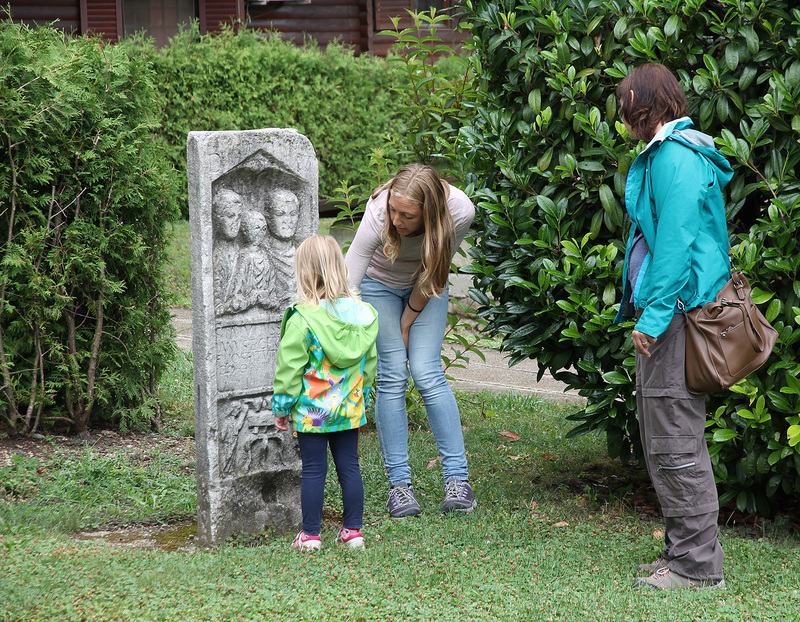 After paying the entrance ticket, she informed us about the historical relevance of the site, its discovery and the many details that can be found on the tombs, which tell stories about each family’s history, antique mythology and Roman lifestyle. This is also our only tip: let the guide take you around: it’s really worth it (and for free!). 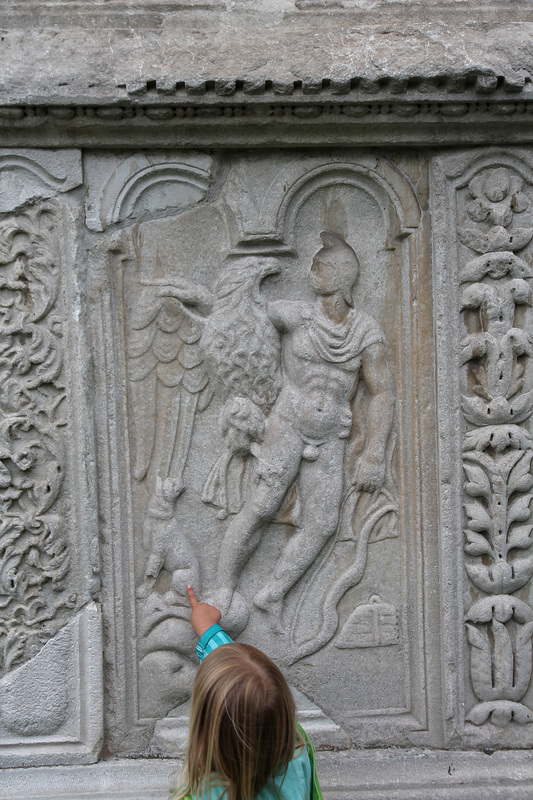 Febe was very interested to learn about the tombs, even the smaller ones. The oldest tomb is Tomb no. I (what’s in a name!). It was built for Gaius Vindonius Successus, the aedile (magistrate in charge of public building) of Celeia. 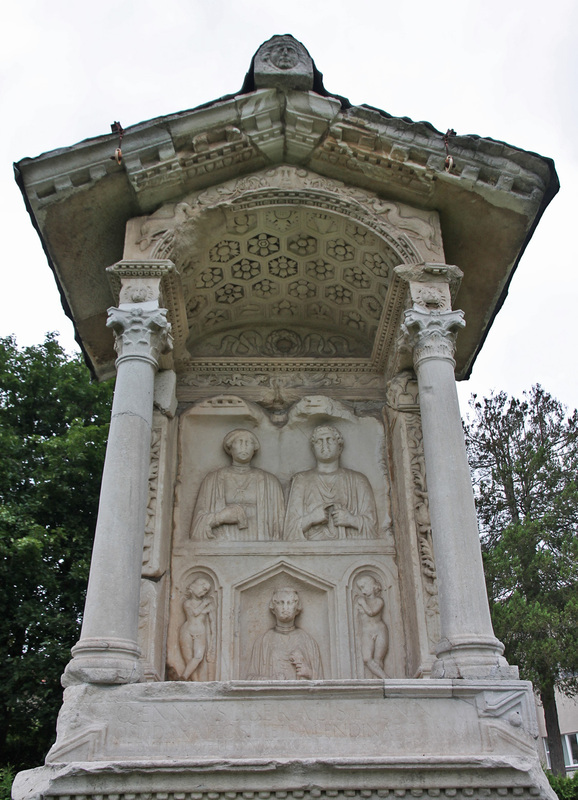 The largest (8m high) is the Spectatius family Tomb, constructed for Gaius Spectatius Finitus, the mayor of Celeia. 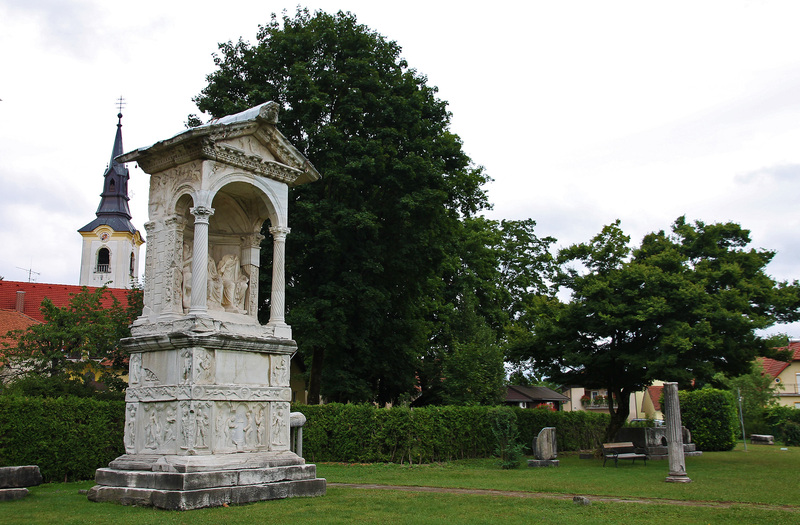 The most beautiful is the Ennii Tomb, commissioned by Quintus Ennius Liberalis and his family. Our favourite statue, however, was that of a griffon. Tomb no.I, or the Vindonius Tomb (1st century). It features Heracles leading Alcestis back from the underworld. 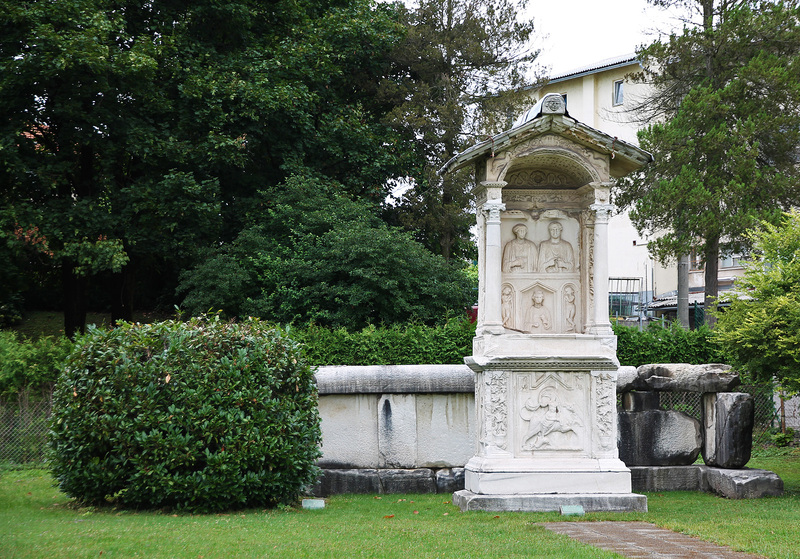 The beautiful Spectatius Tomb (2nd century, front). 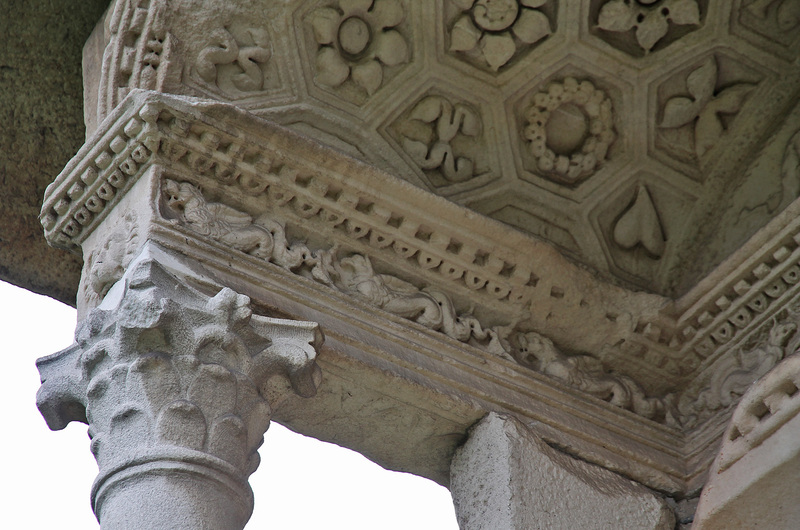 The head of Medusa, guardien of the resting-place of the dead, graces the front of the Spectatius Tomb’s roof. The Spectatius Tomb again. Because it’s so impressive and delicately ornamented. 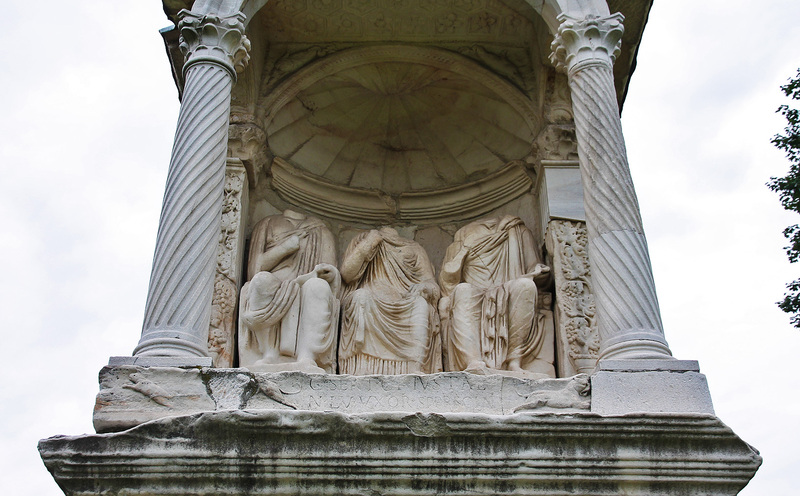 Underneath the canopy roof of the Spectatius Tomb: Gaius Spectatius Finitus, his wife and son. Without their heads. 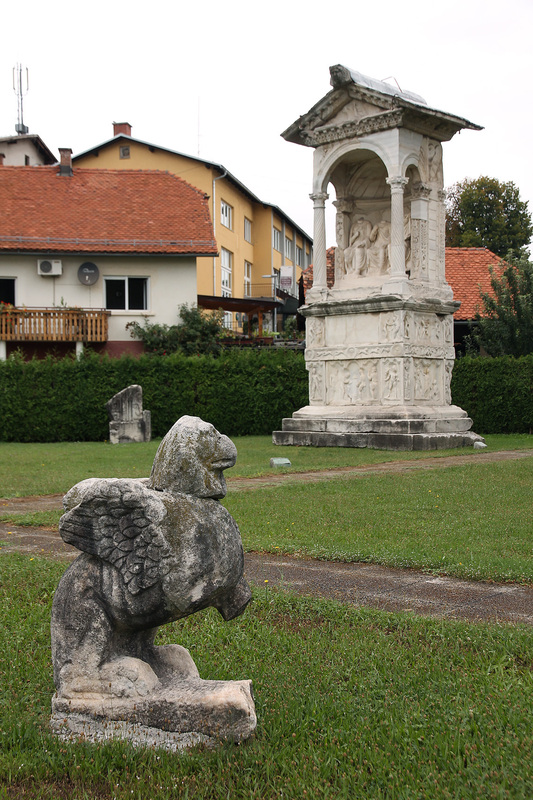 The griffon: a peculiar little statue in the centre of the site. 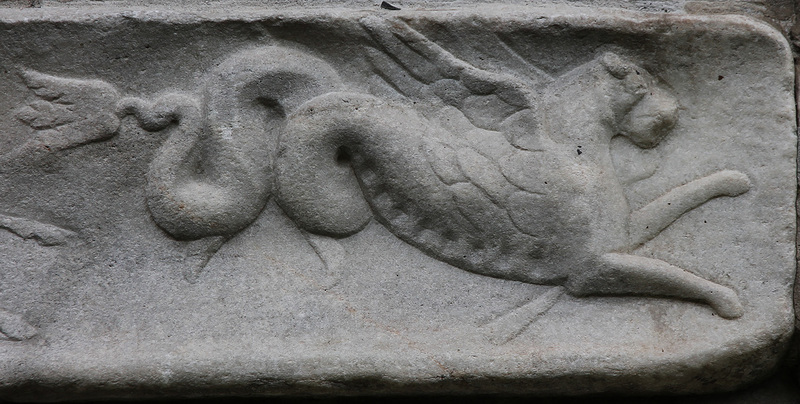 A mythical beast, featured on the narrow frieze of the Spectatius Tomb. The griffon, watching over the Spectatius Tomb. 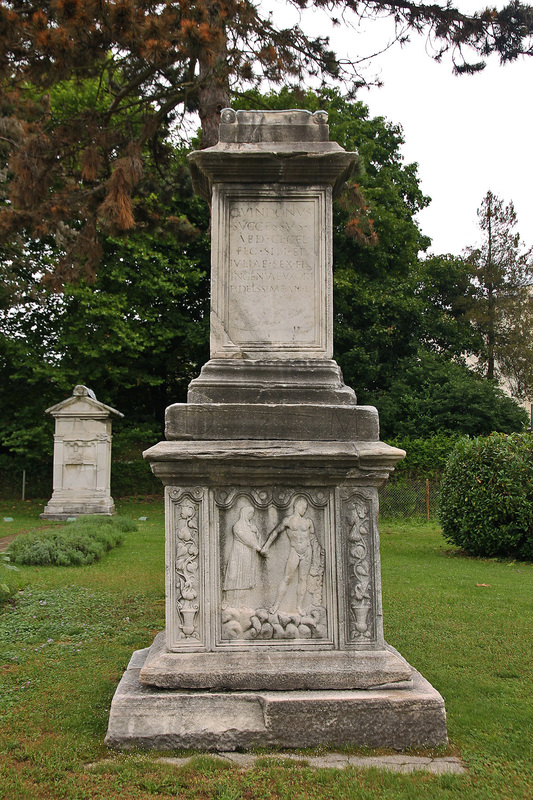 The Ennius Tomb, commissioned by Quintus Ennius Liberalis and his wife Ennia Oppidana (above) for their deceased daughter Calendina (below, centre). It seemed no-one (except for us) needed an antique culture fix that day. Was it the rain? Or is the site too difficult to find in this forgotten centre of the country? Or are most travellers to Slovenia just simply not here for culture? I don’t really know, but I do know this site is really worth paying a visit to. In the afternoon, we tried to reach the Žice Carthusian Monastery, but gave up because the road became too narrow and steep. So we felt it was the perfect moment to make Febe happy with some water fun. Not far from Šempeter, the town of Laško is known for its beer, which has been brewn here since 1825: Laško Pivo. The Laško Brewery is also the largest brewery in Slovenia. But that’s not the reason why we made a detour here. The waters of the Laško springs are known for their healing properties, and a health resort was erected here in the 19th century. 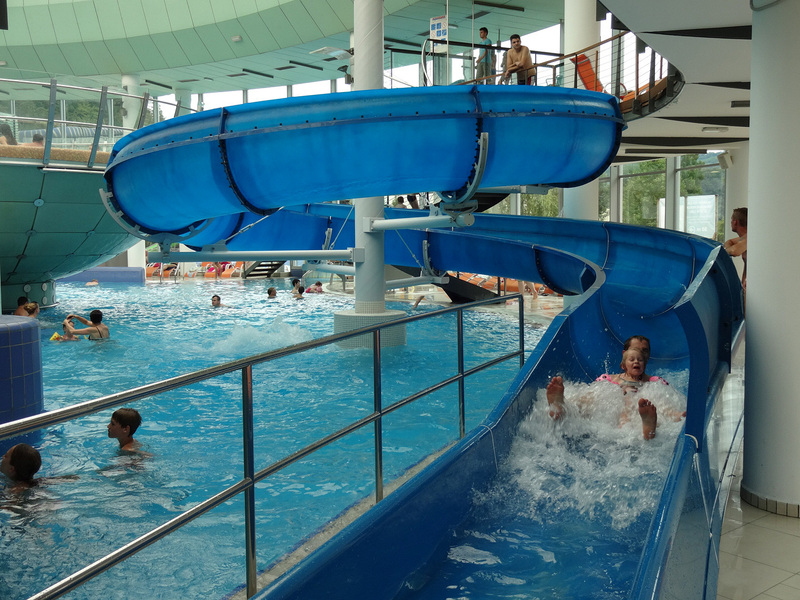 Nowadays, the Zdravilišču Laško (Laško Thermal Centre) is a modern, multipool swimming complex featuring thermal pools, whirlpools and waterslides. The impressive glass dome covering the interior baths makes the experience even more magical. 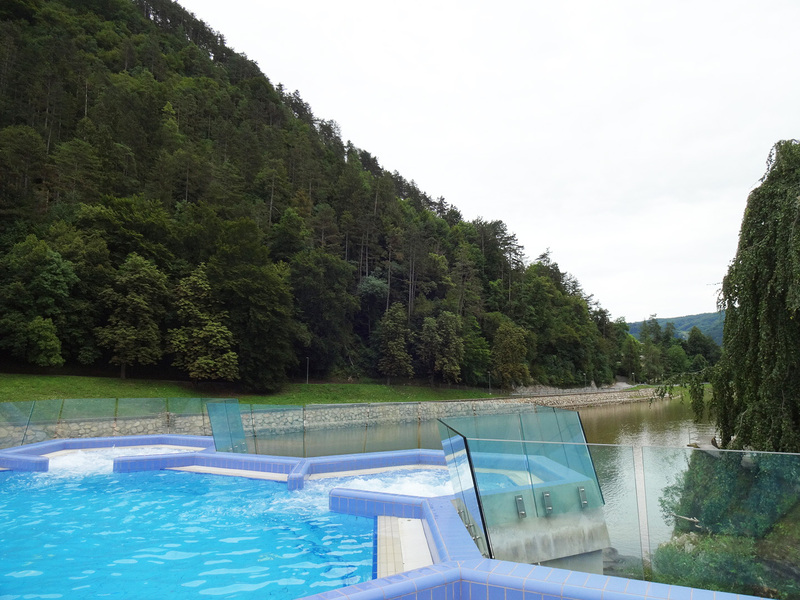 The exterior, crystal- shaped massage pool is situated right above the river Savinja and offers great views over the valley. 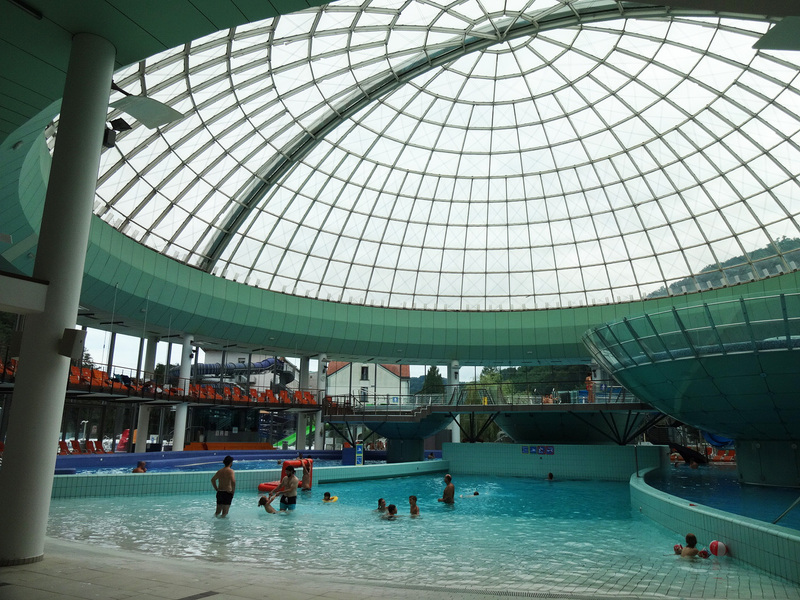 The swimming pool underneath the glass dome. 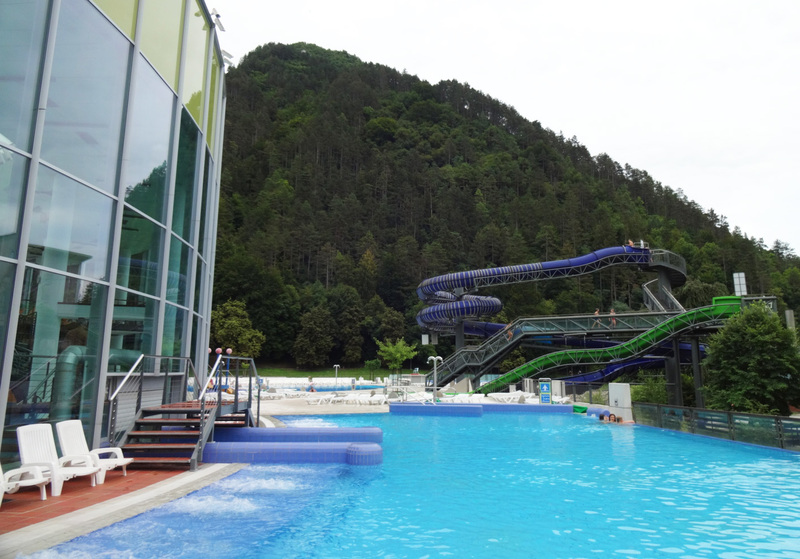 The waterslides. And the view. The view from the whirlpools. Not bad.